From one coast to the other, Pacific to Atlantic, this captivating journey will reveal the must-see destinations across Peru and Brazil from sophisticated ancient civilisations to thriving urban modernity. 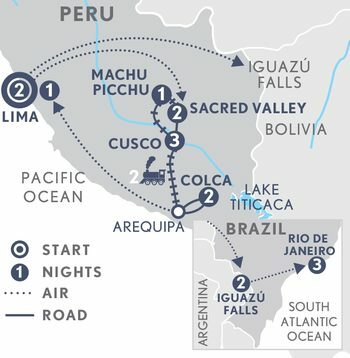 From one coast to the other, Pacific to Atlantic, this captivating journey will reveal the must-see destinations across Peru and Brazil from sophisticated ancient civilisations to thriving urban modernity. Architectural and archaeological attractions abound as well as mesmerising natural wonders. Explore ancient Inca ruins on a pilgrimage to the mountaintop ruins of Machu Picchu. Discover Lima’s booming culinary scene. Wander the cobblestone streets in the fascinating high altitude city of Cusco. Witness roaring cataracts in the jungles of Iguazú National Park and stroll the iconic beaches of Rio de Janeiro. Stay throughout at luxurious hotels and lodges from accommodation connoisseurs, Belmond. Day 1: Arrive Lima, Peru. Welcome to the City of Kings. Perched on cliffs by the Pacific Ocean, Lima is one of Latin America’s most vibrant cities. Upon arrival take a private transfer accompanied by your A&K respresentative to your hotel in the Miraflores district, Lima’s most affluent neighbourhood which sits on a coastal bluff. Soak up the city’s atmosphere, admire neoclassical and Art Deco architecture, sample rich cuisine, and watch street performers during your stay. Ease into local time with a leisurely stroll around the neighbourhood. Discover history, colour, and culture at every turn. Today you’ll be able to appreciate why Lima has such a well deserved reputation in the world of food on a revealing culinary experience. Take a trip to the local market to source fresh ingredients for a hands-on class in bohemian Barranco. With a pisco sour in hand, you’ll become sous chef for the morning as a local chef shares Lima’s classic recipes. Later, lose yourself amongst more than 45,000 classified pre-Columbian archaeological objects in the fascinating and intriguing Larco Museum, a one time private mansion and one of the city’s best museums. Day 3: Lima – Cusco – Sacred Valley. Rise early to unlock the secrets of the capital on a private walking tour led by a local expert. Get the key to one of South America’s oldest houses, Casa Aliaga dating back to the founding of Lima in 1535, amongst hidden courtyards and ramshackle rooftops. Stand in Lima’s birthplace, the Plaza Mayor, and appreciate architectural masterpieces including the historic and beautiful Cathedral, grand presidential palace and Santo Domingo Convent. Continue to the airport for the short flight to Cusco, the former ancient capital of the Inca Empire. Upon arrival meet your Guardian Angel who will assist you on your private transfer to the Sacred Valley. Continue to luxurious Belmond Hotel Rio Sagrado in the Sacred Valley. Once the epicentre of the Inca Empire, the Sacred Valley is speckled with little-known but spectacular ruins, many of which remain unexplored. Visit a remote village seemingly frozen in time. Experience complete cultural immersion as you delve into the ancient agricultural methods used for centuries in this challenging Andean mountain environment. Join in the daily activities and discover how local communities live today. Learn how vibrant food is being cooked in wood-fired, mud-brick stoves. Watch a demonstration of age-old textile artistry and uncover secrets to natural dyeing. Return to your lodge and spend your afternoon at leisure, enjoying the amenities of your accommodation. Day 5: Sacred Valley – Machu Picchu. Board the opulent Belmond Hiram Bingham train bound for the mystic city of Machu Picchu. Enjoy a full afternoon exploring the enigmatic Incan citadel built by the most advanced pre-Columbian civilisation. Climb up and down the rambling stone terraces amongst pitched-roof houses in a dramatic setting between two forest-clad Andean peaks. Feel its pulse as you visualise the lives of the priests, craftsmen and servants who inhabited the seemingly uninhabitable. Day 6: Machu Picchu - Cusco. Delve deeper into the mysteries of the ancient citadel. Take the opportunity to climb to the “Inti Punku”, the famous Sun Gate. For superior views across the ruins, hike further to the highest mountain, Huayna Picchu. Or continue a leisurely exploration of the rambling stone terraces. Later, enjoy tea at Belmond Sanctuary Lodge, before boarding the luxury Belmond Hiram Bingham train back to Cusco. Sink into an armchair in the 1920s-style carriages to relish the fine dining and perhaps a pisco sour before your late arrival at your iconic and luxury accommodation in a former monastery. Sitting at an altitude of 3,400 metres, Cusco’s rich tapestry of Spanish and Quechua influences is yours to uncover this morning on foot. Considered to be one of the most beautiful churches in the Americas, the cathedral in the central Plaza de Armas will leave you breathless. Seek out the fresco of ‘The Last Supper’ with Jesus eating guinea pig, a sacred motif of Incan paganism. Enjoy a short walking tour of this magnetic city. Stroll the cobblestone plazas and winding alleyways, before stepping inside the private cathedral at your hotel. This afternoon is at leisure for you to discover more of this fascinating city your way. Explore the well-preserved ruins of Sacsayhuaman, a testament to Incan architectural skill. Compiled of massive stones, the walls were cut and placed together with incredible precision and without a single drop of mortar to hold them in place. This ancient fortress, where the greatest battle between the Spanish and Incas took place, overlooks the red-tiled roofs of Cusco and the spectacular lush countryside. Days 9 -10: Cusco - Puno - Arequipa. Step aboard the Belmond Andean Explorer and ride the rails from the highest plains of the Peruvian Andes to the depths of the Colca Canyon. Travelling between Cusco and Arequipa, the Belmond Andean Explorer is one of the world’s newest luxury sleeper trains. Wake up to the high-altitude Lake Titicaca at sunrise. Drink in sweeping views from the La Raya pass. Taste a decadent twist on local Peruvian street food prepared by world-class chefs. Dance to live Latin music and sip pisco sours on the observation deck to watch never-ending and unpredictable Peru scenes unfold. In contrast to the striking landscape that glides past, each cabin offers a soothing blend of signature Peruvian accents and in-built oxygen for additional comfort at high altitudes. Hand-woven fabrics and soft, Alpaca-style textures invite a leisurely rest. An en suite bathroom and shower permit luxurious bathing––even at high altitude! Day 11: Arequipa – Colca Valley. Set off on an early morning excursion to the spellbinding, rugged scenery of Lake Lagunillas. Afterwards visit Sumbay Caves, home to fascinating cave paintings estimated at almost 8,000 years old. Bid farewell to the Andean Explorer and take a private transfer to the Colca Valley, one of the deepest canyons in the world, stopping en route to explore the local town of Chivay and enjoy a lunch at a local restaurant. Continue to your luxury and secluded hideaway surrounded by spectacular landscapes, warm local communities and astounding nature. Rise early and travel to Cruz del Condor and marvel at the sheer size and depth of the canyon. Watch the majestic flight of the condors and enjoy the sight of this impressive and rare bird species riding the warm air currents. Covering 14 hectares of Colca Canyon, there are plenty of walks and treks within the hotel grounds. Feed alpacas at the property’s on-site farm and learn about traditional Peruvian farming techniques. And the more adventurous can venture further into the canyon on horse back. Day 13: Colca Valley - Arequipa - Lima. Begin early with your private journey to Arequipa recently named by Forbes Magazine one of the coolest cities in the world for its colonial splendour, breathtaking Andean landscapes and gastronomy. Wander around the main square of the so called “Ciudad Blanca” (White City) and admire the imposing cathedral and the Santa Catalina Monastery before proceeding to the airport for your flight to Lima. On arrival transfer to your hotel. Day 14: Lima – Iguazú Falls, Brazil. Return to the airport for your flight to Foz do Iguaçu Airport in Brazil. The mighty Iguazú Falls is one of the New Seven Wonders of the World and located on the border of Brazil, Argentina and Paraguay. Upon arrival, transfer to the only accommodation located inside the Brazilian side of the national park. No visit to Iguazú is complete without experiencing them from the Argentinian perspective, as today’s tour will prove. Cross the bridge to Argentina and wander along the network of pathways around the endless sheath of water. Venture by train to the suspended platform at the very brink of the roaring ‘Garganta del Diablo’ waterfall (Devil’s Throat). Embark on a jeep ride through riverside jungle following the Yacaratiá trail to Port Macuco. Here, a motorboat awaits to take you up the Lower Iguazú River, through rapids into the roaring Garganta del Diablo canyon at the heart of the falls. Later you may like to take a helicopter flight (additional charge) over the Iguazu National Park for an unrivalled view of the waterfalls, Três Fronteiras (the meeting point of Argentina, Brazil and Paraguay). Day 16: Iguazú Falls – Rio de Janeiro. Spend time on the Brazil side of the falls. Descend into the canyon and soak up the vista of some 275 falls, before taking a glass elevator back to the top. Continue with a private transfer to the airport for your flight to Rio de Janeiro. Upon arrival be met by your local A&K representative who will accompany you to your luxury beachfront accommodation. Enjoy the remainder of the day at leisure. Day 17: Rio de Janeiro. Why not begin your day hovering over Sugar Loaf Mountain, Christ the Redeemer and the golden beaches of Ipanema and Copacabana on a helicopter flight over the city (additional charge)? Then, navigate the streets by bicycle, taking in the hotspots of Copacabana, Ipanema, Leblon and Rodrigo de Freitas lagoon. Reward yourself with refreshing exotic fruits from a local street market. Having gazed at Sugar Loaf from Copacabana beach, take a driving tour through local neighbourhoods to the base of the mountain. Enjoy the cable car ride to the summit for the best sunset views in the city and sundowners with a backdrop of the city lights twinkling through the sea mist. Day 18: Rio de Janeiro. Witness one of the Seven Wonders of the Modern World, Corcovado’s Christ the Redeemer. Gaze skywards at the sandstone figure towering 38 metres into the air, with arms pointing north and south, and breathe in sweeping views of the city rightly considered a UNESCO World Heritage site. Drive back to your hotel via the Maracanã stadium and famous Sambadrome, home to the annual Carnival parade. Head to the bohemian Santa Teresa neighbourhood on Morro do Desterro (Exile Hill) for a taste of Old Rio. Take to the hills in a charming street car, seek out art studios and bars, and stop at the “Little Castle”. Your afternoon is at leisure. Or you may choose to continue your discovery of this lively city your way. Step backstage into the captivating world of Rio’s Carnival, see the making of the elaborate costumes and imaginative floats (additional charge), or visit the Botanical Gardens, one of the world’s most important ecological sanctuaries, at the foot of Corcovado Mountain (additional charge). Day 19: Depart Rio de Janeiro. Enjoy a final stroll along the beach before your private transfer to the airport for your onward journey or continue your discovery of Brazil by visiting Paraty, a UNESCO World Heritage site and charming town on Brazil's Emerald Coast.